Will it Rain on Easter Sunday? 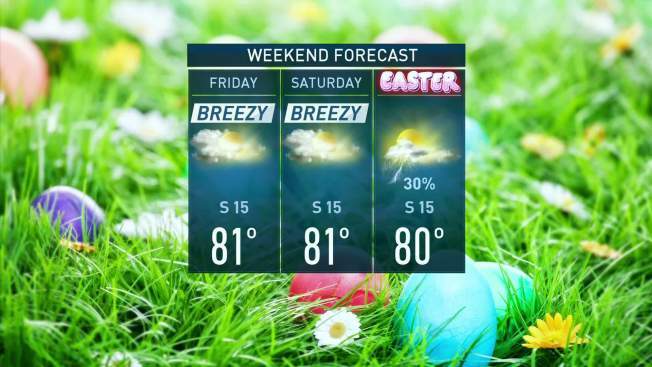 There is a 30 percent chance of rain on Easter Sunday for North Texas. The forecast models the NBC 5 Weather Experts use for reference have been disagreeing with each other and still have yet to come to an agreement. It is looking like a few scattered showers, maybe a storm, will impact North Texas Sunday afternoon and evening. Not everyone will see rain. Easter Sunday is by no means expected to be a washout. If anything, you will have a brief rain delay from your outdoor plans. It will be warm and breezy with highs in the low 80s with breezy south winds. Keep checking back with our weather experts online and on air for updates.